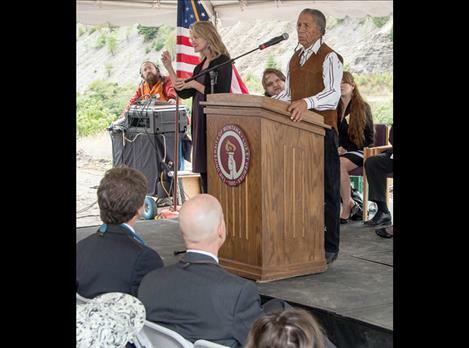 Salish elder Louis “Louie” Adams speaks at the groundbreaking for the new Missoula College building on Aug. 22, 2014. MISSOULA – Salish tribal elder Louis “Louie” Adams has spent a lifetime teaching others the stories, culture and language of his people. The University of Montana honored this tireless educator with an honorary doctorate of humane letters. His nomination was approved by the state Board of Regents on March 6, and he will be awarded the honorary doctorate during UM’s 118th Commencement Ceremony Saturday in Washington-Grizzly Stadium on May 16. Born in 1933, Adams worked on the family farm before becoming a jockey in the summer horseracing circuit. He then joined the U.S. Navy for four years, serving as a gunner’s mate on a destroyer during the Korean War. Returning home to Montana, he worked various jobs, including decades as a forester for the Bureau of Indian Affairs and the Confederated Salish and Kootenai Tribes. He retired in 2002. Adams served 14 years on the tribal council starting in 1976, and he remains active with the Salish-Pend d’Oreille Elders Cultural Advisory Council and many other groups and organizations. He has shared his knowledge at countless meetings, classes, field trips, speaking engagements and traditional gatherings throughout the Pacific Northwest, including frequent stops at UM. Adams grew up speaking Salish and is dedicated to preserving the language. George Price, a faculty member in UM’s history and Native American studies departments, said Adams never turns down requests to speak at departmental graduations and other Native tribal events across campus. All but one of Adams’ eight children attended UM.